What size magnet do I need to ______? This is how so many great magnet questions start. We try to provide simple, concise answers, but the truth is often more complex. This month, we tackle a seemingly simple question: What size magnet do I need to hold a hammer to a belt? We’ll provide some specific examples of pitfalls and solutions, showing our work along the way. Hopefully, some of the advice will help answer your own magnet questions, even if you’re not trying to hold a hammer. The hammer we’re using for this article weighs about 1.5 lb. That information should help make this problem easy. K&J has pull forces listed for all their magnets, so all we have to do is pick a magnet that’s a bit stronger than 1.5 lb. Right? If only it were that simple, we could end the story here. Our first magnet choice is a 3/8” square block, the stepped SB664-OUT. 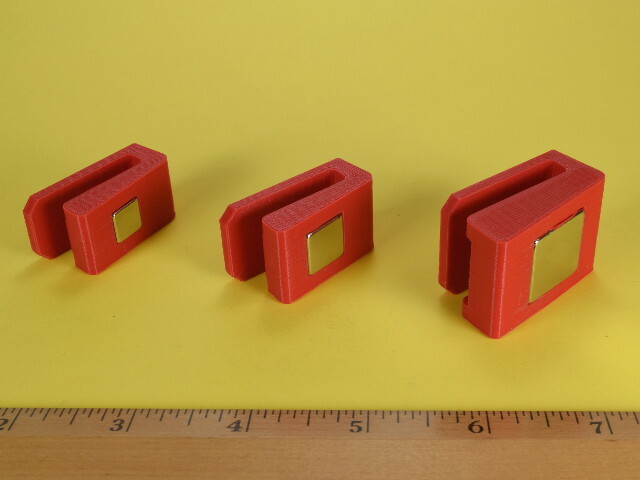 While you could use simple blocks or discs, we’re choosing a stepped magnet here because it’s easier to insert and secure into our plastic belt clip design. This magnet is listed with a Pull Force, Case 1 of 9.2 lb. What does that mean? When we try pulling one of these magnets directly away from a big, thick steel plate, it takes about 9.2 lb to pull the magnet free. Think of this another way: with a magnet stuck to a solid steel ceiling, we should be able to hang 9.2 lb of stuff from it before it breaks free. The SB664-OUT magnet easily holds the hammer in this setup, much like Pull Force, Case 1. The head of the hammer is a nice, thick steel surface for the magnet to grab onto. If we use the magnet to hold the hammer from above, it’s more than strong enough. 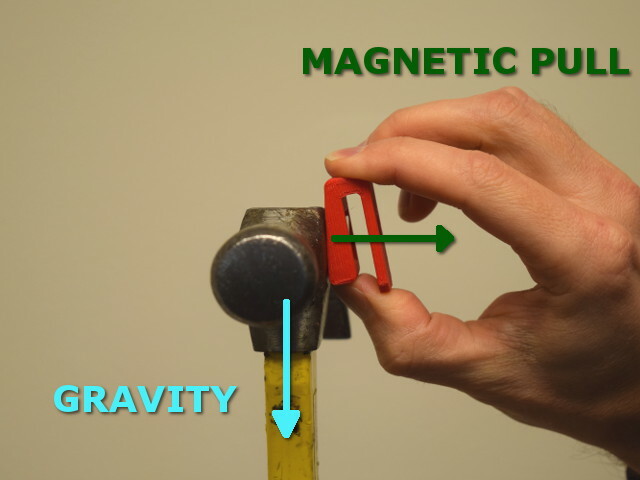 Gravity pulls down with 1.5 lb of force, and the magnet pulls up at something close to 9 lb of force. The hammer sticks to the magnet. The magnetic pull force isn't helping against gravity. On a belt, though, the setup is a little different. Instead of having the magnet above the load of the hammer, it’s off to the side. The magnet pulls the hammer sideways towards the clip, but gravity is still pulling down. Using the same SB664-OUT magnet and clip as before, the setup only barely holds on when installed on the belt. The slightest bump sends the hammer crashing to the floor. It fails to hold the hammer well on a belt. 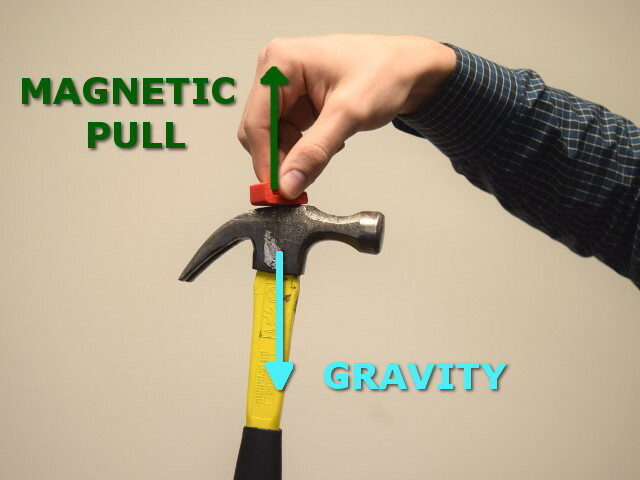 Instead of directly resisting the pull of gravity, the magnetic force of the strong magnet is only helping hold the hammer up against the clip. Only friction between the surfaces keeps it from sliding down. Successively bigger magnets in the same belt-clip design. 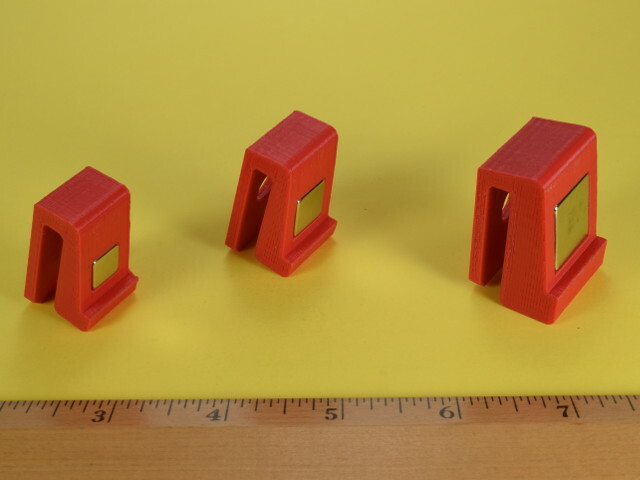 Left to right: An SB664-OUT is 3/8" square x 1/4" thick, an SB884-OUT is 1/2" square x 1/4" thick and the SBCC6-OUT is 3/4" square x 3/8" thick. If the little, 3/8” square SB664-OUT magnet didn’t work, how about a larger size? The ½” square SB884-OUT provides more strength. Its listed pull force is 14 lb, much greater than the 9 lb of the first magnet. Testing on the belt, however, yields similar results. While it sticks with more force, it is still too easy to slide off with mild jumping. Lastly we try the powerful, ¾” square SBCC6-OUT, listed at over 31 lb of pull force. It grabs the hammer with a resounding snap! While the hammer still slides down a bit, it holds well enough. This powerful magnet solved the problem, but we’re not sure it’s the best solution. It’s a powerful hold, but there’s still some slipping going on. We might worry about pinching a finger with such a strong magnet. Also, repeated impacts during use might ultimately damage the brittle magnet material. More magnet power helps, but there might be a better answer. This alternative design uses a rubber coated BX084BR-N52 block magnet. If friction prevents the hammer from sliding, let’s increase the friction. Our next attempt uses a 1” x ½” x ¼” thick BX084BR-N52 magnet. This magnet has a layer of natural rubber molded around it, providing an extremely grippy surface. While the listed Pull Force, Case 1 number isn’t as high for this magnet, it works astoundingly well in this application. The pull force is enough to provide a good grab, but it’s the grippy surface that really prevents the hammer from sliding down. Increasing friction is a great solution. It gets the job done with a smaller magnet. We also like how the rubber coating protects the hard, brittle magnet material from damage due to repeated hammer impacts. There's a nice selection of off-the-shelf, rubber coated magnets in our Plastic and Rubber Coated Magnets section. Even if you don't use one of these products, you still might consider how a thin layer of grippy material can improve the performance of any magnet. With a small ledge to rest on, the small SB664-OUT magnet holds the hammer quite well. The mechanical design of the clip can be made to bear the weight of the hammer. 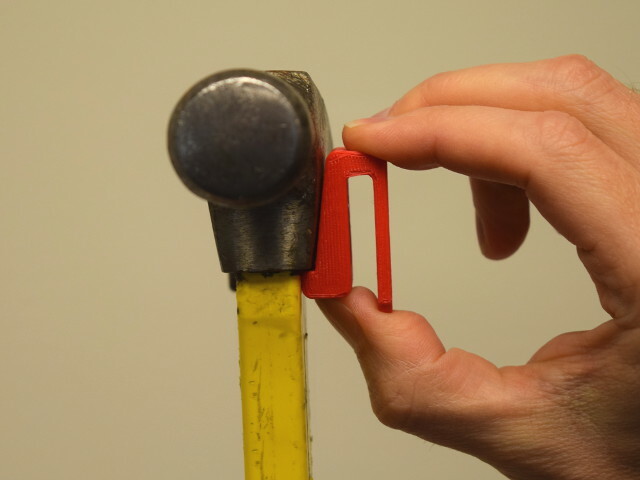 In this setup, the magnet only has to hold the hammer up against the clip, while the lip at the bottom of the clip bears the weight of the hammer. This is another great solution that allows the use a much smaller magnet while still getting the job done. We tested this idea with those same three magnet sizes. The surprising result was that it worked well even with the smallest magnet, providing a decent, secure hold. Clips with the same 3 magnet sizes, but now with small ledges to support the hammer. The ½” square SB884-OUT clip felt like the right balance of strength and security, while not being too aggressively, finger-pinching strong. In an informal poll here at K&J, this solution tied for first place with the rubber coated magnet. What’s the minimum size needed? How can I minimize magnet cost? What is going to be secure enough to prevent the hammer from breaking my toes? How does rough handling affect the choice? We’re presenting these results after trying and testing a bunch of options. To be honest, we really didn’t know what magnet size and strength we would recommend before building some ourselves. We had to try a number of ideas before finding the strength we liked best. Even after doing all this testing, the magnet we'd choose still depends on the details of how we're using it. Keep this in mind with your own magnet projects. 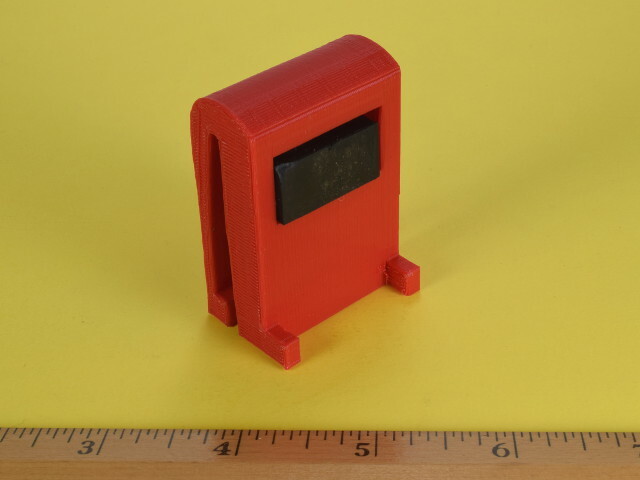 K&J Magnetics doesn’t have a minimum order requirement, so you can order a few magnets in many sizes to try out and prototype. While it takes a little longer to prototype first, we’ve always learned something in the prototyping process that makes the end result better. If your task is to make 100 belt clips, it just might be the cheaper/better/faster solution to prototype with half a dozen different magnets first, and then place a second order for the 100 magnets you know will work. Bonus: Forget hammers, how about an iPhone? We were going to end the story here, but couldn't resist one more belt-clip example. We just had to try making a magnetic belt clip for an iPhone. A specially designed holder uses magnets and a ledge to support an iPhone onto a belt clip. The 3D-printed iPhone case incorporates a magnet glued onto the backside. It works nicely! Various Apple devices contain several environmental sensors, including an ambient light sensor, a magnetic compass, a proximity sensor, an accelerometer, and a three-axis gyroscope. Cases should be designed so they do not interfere with the operation of these sensors. Case designs for Apple devices should avoid the use of magnets (for example, as closure devices) and magnetic materials. Cases with parts made of any metal should be tested to verify that they do not affect an Apple device’s built-in magnetic compass, if any. Besides their effect on a built-in magnetic compass, magnets in cases can affect other sensors and electronic components. Cases should not include magnets unless there is no other practical design solution and only if they do not affect the operation of the Apple device in any way. Further reading on similar subjects from past articles includes How Much Will a Magnet Hold? and Leverage and Friction.